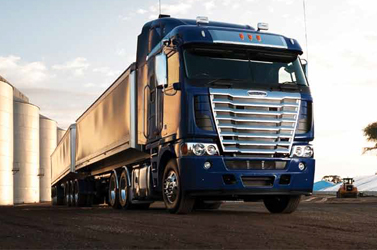 The brilliant New Generation Freightliner Argosy stands alone as Australia's leading on-highway freight specialist. It's a new generation. It's the new standard. Behind its spectacular new appearance, this Argosy has been designed to be everything you want. It's got durability built into every aspect. It's a powerful road warrior which will work for you day in, day out, even in the toughest conditions. It's high performance and low maintenance so you get the best result out of every load. And it's a sheer pleasure to drive with a spacious and safe cabin that will leave you feeling great at the end of a long haul. With up to 6'7" of headroom and a completely flat floor, the Argosy's cabins are truly walk-through, and once you sit down the new EzyRider II air suspended seats offer comfort and lumbar support across an array of positions. There are clever storage compartments wherever you look, and external locker boxes can be accessed from inside the cabin. Dash components are completely injection moulded, with timber look furnishings and ivory gauges. After a day on the road you can walk into your roomy bedroom and enjoy bunks that are up to a luxurious 51" wide. Privacy curtains keep out the light and sound-deadening material keeps out the noise. And a high-performance airconditioning unit will keep you comfortable, day and night. A great truck has to have great power. That's why Freightliner's New Generation Argosy comes with the choice of the best engines from two of North America's best engine manufacturers. It's power you can trust. 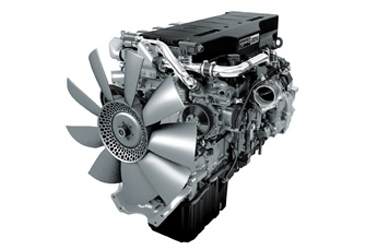 Detroit Diesel's all new groundbreaking DD15 provides up to 560 hp and 1850 lb-ft of torque. While Cummins' legendary ISX and Signature engines are available with up to 600 hp and torque of up to 2050 lb-ft. Lots of power. Bigger loads. Easier driving. All are fully ADR80/03 compliant. 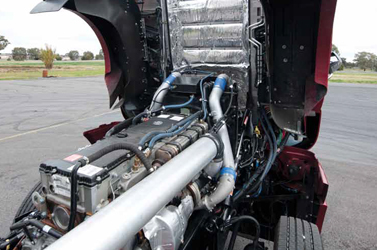 Freightliner's engineers have left nothing to chance, giving the New Generation Argosy a truly exceptional cooling package. Big, effective and robust, it can handle anything so this truck will keep working and keep earning. 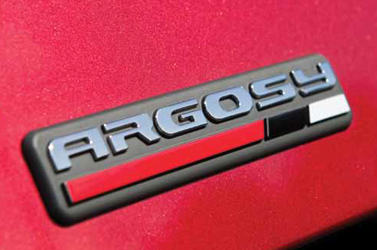 It starts with the massive engine/ chassis-mounted, 1650 sq2 high-efficiency single aluminium radiator – Argosy's most efficient ever - but it goes much further. A specially-designed 11 blade fan, a more efficient charge air cooler, a new air conditioner condenser and a large capacity header tank all add to the Argosy's incredible ability to keep itself cool. We've even adjusted the cabin height and designed a new front firewall to optimise air flow past the engine bay, to give the engine the coolest possible working environment. We hate downtime as much as you do, so we've designed durability and ease of maintenance into every aspect of the New Generation Argosy. The giant grille tilts up to 120 degrees so drivers can easily access daily check points. The cab itself tilts through 75 degrees thanks to an effortless 'electrical over hydraulic' tilt function. With complete access to the engine, jobs that could take hours only take minutes. Coming as standard on the Argosy, Meritor's Permalube drivelines are maintenance free and their large, high capacity, front axle wheel bearings are designed to keep you on the road longer. Of course, with a Freightliner you also benefit from having 45 specialist service and parts authorised dealers right across the country. Built not just to survive, the New Generation Argosy has been tested like no other to ensure it will thrive no matter what you throw at it. Configured as a fully loaded B-double or road train, the Argosy has cruised through dynamic testing in temperatures averaging 46 degrees, repeatedly driving up 7% gradients nearly 30 kilometers long. 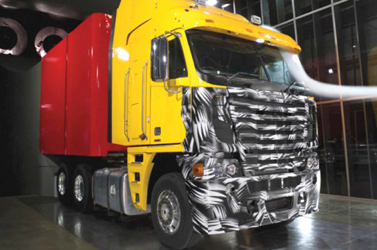 It's being subjected to endurance tests of more than 2.5 million kilometres of on-road testing and passed aggressive cab shaker tests at Freightliner's research and development facilities. Full scale wind tunnel tests have also made the Argosy very "slippery". 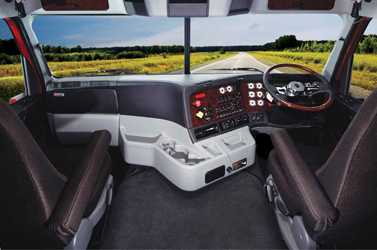 The 24 degrees windscreen deflects air upward and through the Argosy's open visor, minimising turbulence and cutting running costs. And with a light overall tare weight allowing payloads to be maximised, the New Generation Freightliner Argosy has been designed from the wheels up to pass the ultimate test – turning a profit. 8x4 only available with 90" Cab.